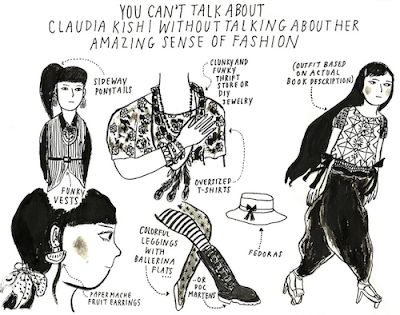 Updating the outfit: Claudia Kishi, Live From WSTO! "Anyway, I wore the coolest tuxedo I'd recently bought in a thrift shop, including a silky, piped shirt and a bright red velvet cummerbund. I removed the shoulder pads from the jacket, which made it really slouchy (I love that look). Then I bought a pair of white socks with silver glitter. I decided to wear a pair of red sneakers to match the cummerbund. I swept my hair up and fastened it with a rhinestone barrette in the shape of a musical note." Love it. Seriously, she's fabulous, and Ashley Wyeth better recognize. 2012 Claudia (also Trust Fund Claudia -- I recognize that her Helmut Lang pants and Marc by Marc Jacobs duds aren't likely to be obtained on a babysitter's salary) would rock a clear musical score umbrella with her version. Even if it wasn't raining. 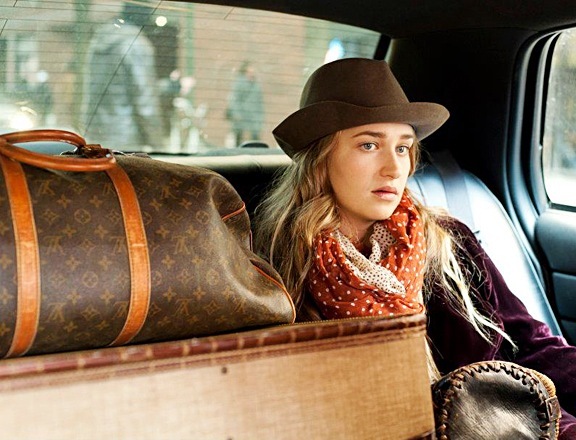 That's just the kind of free spirit she is. Also a red wraparound Swatch she probably borrowed from Stacey and forgot to give back, and red Converse that she stayed up all night studding. She'll explain her technique on the radio show, don't worry. Read the original book entry. I think the most important takeaway from this book is that Claudia has a seventh grade boyfriend who gets nervous about going out to dinner with members of the Babysitters Club. Think about it. Imagine being nervous about dinner with Mary Anne Spier. "I'd worked hard on my outfit - a long black skirt, a white shirt with full sleeves, and a short vest that I'd covered with bright-colored buttons and bows. My hair was braided with strands of ribbons that matched the decorations on the vest." Once you de-Seinfeld the "white shirt with full sleeves" aspect of the outfit, this actually sounds pretty bomb. Get it gurl. Okay, I zoned out a little bit, like Claudia after a serious Hershey's Kisses sesh. It's not my fault. I started a new job in September and I'm like really busy you guys. I got babysitting jobs for days if you know what I mean (you don't, and neither do I. I'm in marketing. The only babysitting I'm doing is of our Google Analytics account -- my personal Jenny Prezzioso.). But! As penance, I have lined up three weeks of outfit updates for you, and until those start going live please feel free to nod thoughtfully at all of the things I would've purchased for this job if I didn't have to do things like 'pay rent' and 'buy food'. Also, if you want to know what I'm up to during daytime (and, yeah, sometimes nighttime too) hours, you can follow Prosperity Candle on twitter, facebook, and pinterest. In fact, I encourage you to. There's less swearing but more doing good things for the world and stuff. Also, we sell candles. I'll let you know when I figure out how to successfully pitch a BSC tribute candle. "Wow, it's the Babysitters Club dolls!" "I want to be like Dawn! She's so natural, right down to her jean jacket!" Yeah, okay kid. . . . wait, what about a jean jacket is natural? You guys. I'm innocently browsing the Madewell fall catalog when suddenly I find myself staring at perhaps the most Claudia-approved sweaters of all time. I had to drop everything for this one. Read about the infamous sheep fight in Kristy's Great Idea. A while back -- you know, when I was actively updating -- some of you suggested I use polyvore. 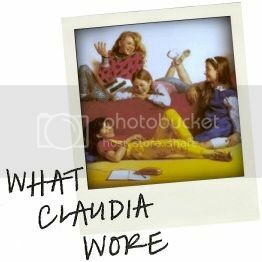 Some of you also suggested I re-create Claudia's outfits myself. I assume that subset had been dipping into Sharon Schafer's special brownie stash or something. I mean, what were you thinking? I can't pull off a high side pony! But I CAN try to create less offensive versions of Hodges Soileau's attempts at fashion through the magic of online collage sites. So: updating the outfit begins with book #42, Jessi and the Dance School Phantom. What a cover. Jessi looks more stankface than scared, and then there's Dawn. With that hair. That hair*. It's so bad that the first update I made to her outfit was a VO5 hot oil treatment, because there's no excuse for that situation on top of her head. Her Texas Tuxedo would be slightly more acceptable if she was wearing grey jeans, and when I think California Casual I think Swedish Hasbeens. Mostly because the early books kept mentioning Dawn's affinity for clogs and it just stuck. And orange slice earrings because California. Obvi. * little Lucille Bluth nod for you there. So, what's new with you? Things are cool over here. I live practically across the street from an Urban Outfitters now, which is kind of troubling for my wallet. Also I haven't bought any new Fryes in a really long time but that doesn't mean I haven't made all sorts of other terrible purchasing decisions. But you're probably not here to read about me, even though the fact that I'm a blogger means I'm inherently kind of narcissistic and you're gonna end up reading about me anyway. We both know who you're really here for. And she's back. At least for a little while. I've got some entries queued up and some strange outfit descriptions for us to ponder together and I just vacuumed the floor of my bedroom so BSC meetings are gonna be a little less dusty. Also the adverb abuse will continue. That I can absolutely promise you.